School lunches have caused much frustration in our household. Simply being vegetarian makes it almost impossible for the girls to eat the lunches offered by the schools. Certainly getting any variety in their meals would simply not happen, so I pack lunches for them. So, what foodstuffs are child friendly, vegetarian, dairy free, non-junk, portable, and still appetizing by the time they’ve sat in a backpack (along with all the jostling that those bags get) for 4 or 5 hours? I also have a preference for preparing gluten free lunches, so that I can check flavors and avoid contaminating my kitchen with items that will have a noticeably adverse effect on my system. The girls both like cashews, candied pecans, candied walnuts, cranberries, dried blueberries, and raisins, and they can eat them at break time or on the bus home. Dried fruit and nuts also have the advantage of not going to waste or going rotten, if they’re not eaten up on the day you pack them. 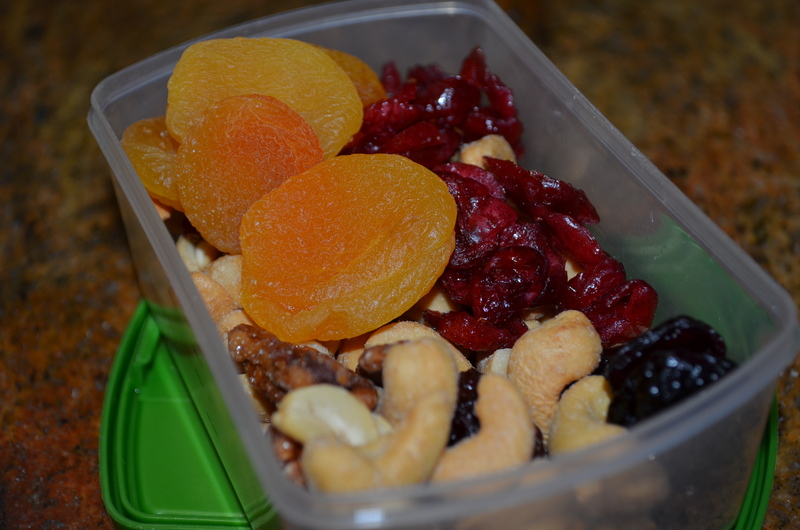 Dried apricots, cranberries, cherries, salted cashews, and candied pecans. 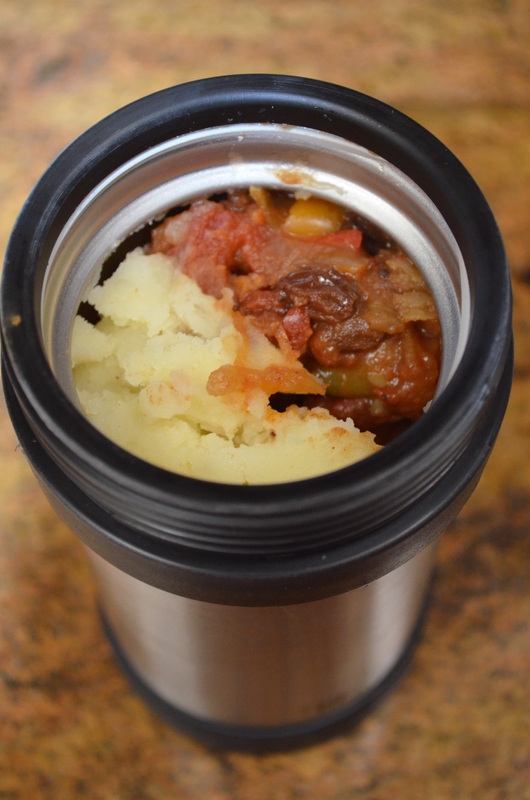 I invested in a couple of wide necked stainless steel Thermos flasks with collapsible spoons for carrying stews and suchlike; a couple of Wrap-a-Mats for drier items; and some snap shut plastic containers of various sizes for salads, dried fruit and nuts, and relishes. Meetoo and GF pasta packed in an insulated container. 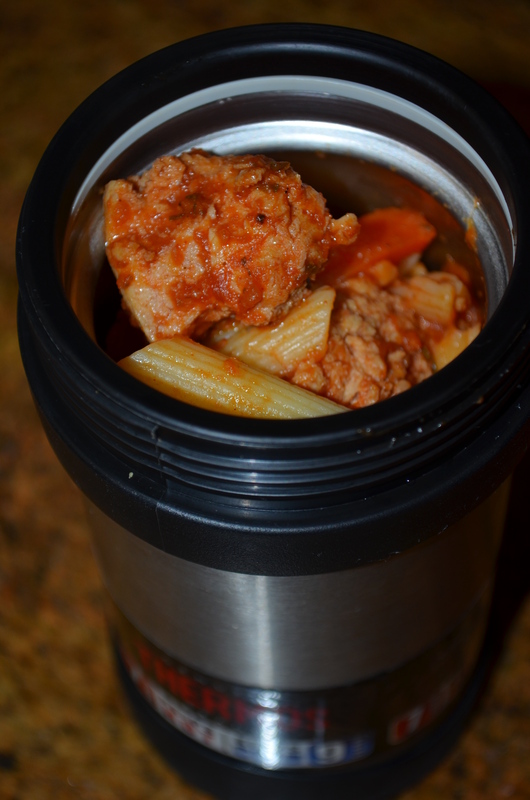 The meetoo is a fairly dry sauce and doesn’t carry on softening the pasta while it’s in the Thermos flask. My kids were both very positive about this lunch. It does, however, take a while to make, so you either have to get up early to make it (my choice), or make it the night before and then just heat up the sauce and cook the pasta in the morning. I warm the insulated flask with boiling water before draining and adding the food. Apparently it makes a difference to how hot the food is when the girls get to it. The meetoo recipe mixed with 6 oz of dried GF pasta (cooked), makes enough food for 3 to 4 people, so I tend to have some for lunch, too. The girls love this cheez sauce. They tell me that the cauliflower and potato need to be kept in small chunks so they don’t have to try cutting the pieces with their collapsible spoons. We initially had this with pasta, but the sauce was sufficiently wet that the pasta was stodge by the time the girls came to eat it (they still ate it, but they got ‘looks’ from some of their mates). I cook the vegetables on the firm side to try to help them keep their integrity. I’m sure small chunks of other vegetables would go down well, here too. Stir the hot cheez sauce with pre-cooked vegetables (~1 1/2 cups of veggies per person), and pack in preheated, wide necked Thermos flasks along with a spoon. 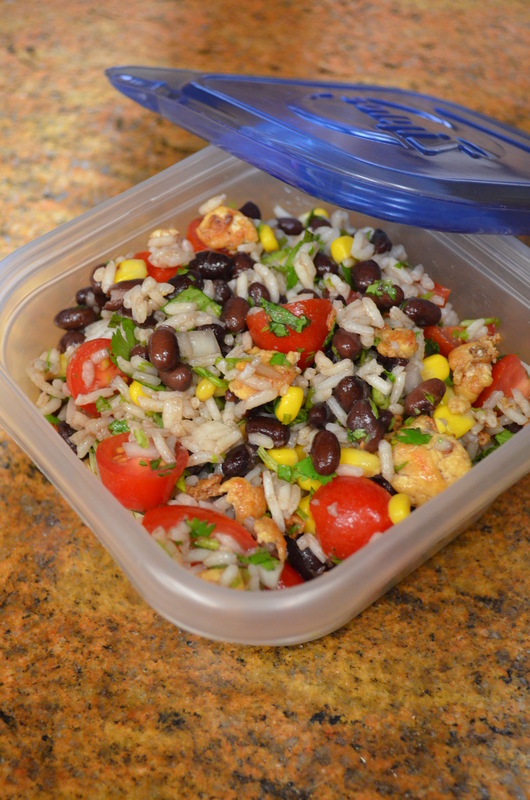 This cold salad is easy to pack in snap shut containers. I confess that I add an elastic band (taken from the stalks of broccoli) and double wrap with a plastic freezer bag, as we have had an accident before now, with the lid not being completely shut. The quantities given are approximate, and you should fudge them according to taste and appetite. My girls think the fresh cilantro (coriander leaf) is essential, though, so I wouldn’t miss that out. Personally, I think the lemon/lime juice adds a sparkle to the dish, and shouldn’t be missed either. Rinse the rice to remove starch, and cook (tightly covered) with 1 1/2 cups water (or 2 cups water if the rice is brown) and the salt, until the water is no longer visible, or according to packet instructions. Turn off the heat, and allow to cool, still covered. Drain the tofu and cut it into chunks (~1/2 inch cubes). Pat dry with kitchen paper or clean towel. The drier it is, the less it will stick in the pan. Heat the oil/fat in a well seasoned cast iron or non-stick pan until hot, and fry the tofu for about 5 minutes, stirring frequently with a sharp edged plastic spatula, until brown. In a large mixing bowl, combine the tofu with the Braggs (or other GF soy sauce alternative). 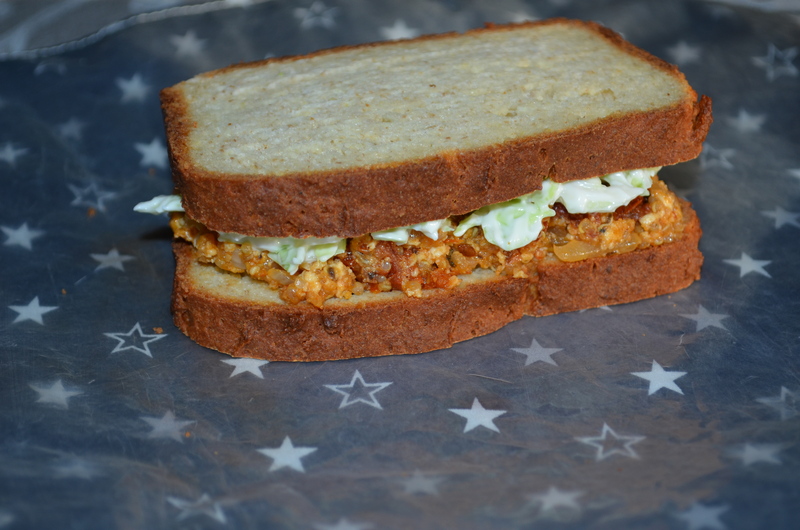 Sun-dried tomato pate with coleslaw in almond bread, sitting on the Wrap-a-Mat that I was about to wrap it in. Two slices of almond bread with either Sun Dried Tomato Pate or Mushroom Pate, with an optional thin layer of coleslaw. This lunch gets 2 thumbs up, though daughter #2 STILL won’t eat her crusts! I pack this in a Wrap-a-Mat. This is a deliciously rich affair, which is good enough for a dinner party, as well as good enough for school dinners. 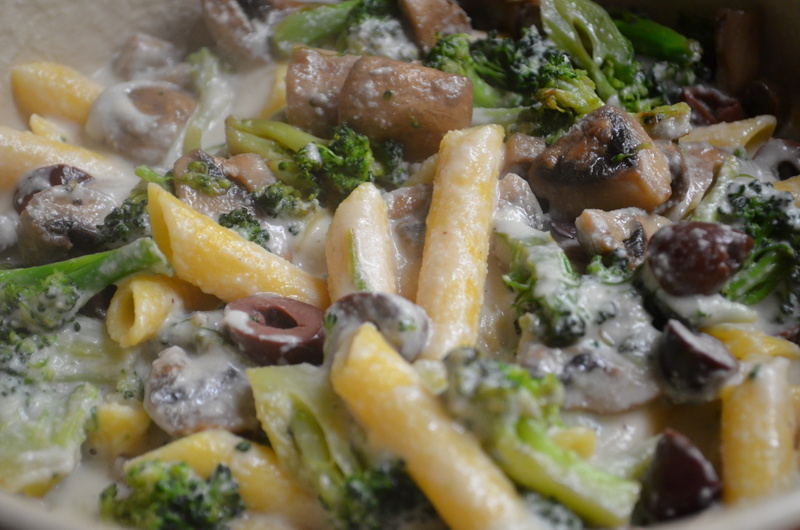 Cook this sauce, substituting 8 oz of broccoli for 1/2 of the mushrooms, and mix with 8 oz dried GF pasta (cooked). I send this off in a warmed thermos and with a fork. Note that it serves about 4 people, so not all of it walks off to school. There’ll be some left for other folks. This seems much more in keeping with old-school style meals, but daughter #2 will clean out the pot with enthusiasm. I mash the cooked potato with salt, pepper, Earth Balance (vegan non-hydrogenated margarine) and a little plain rice milk, then squish it down one side of the Thermos container. I then spoon hot tagine down the other side of the container so that she can eat a bit of both all the way through the meal. This is another hot weather lunch. 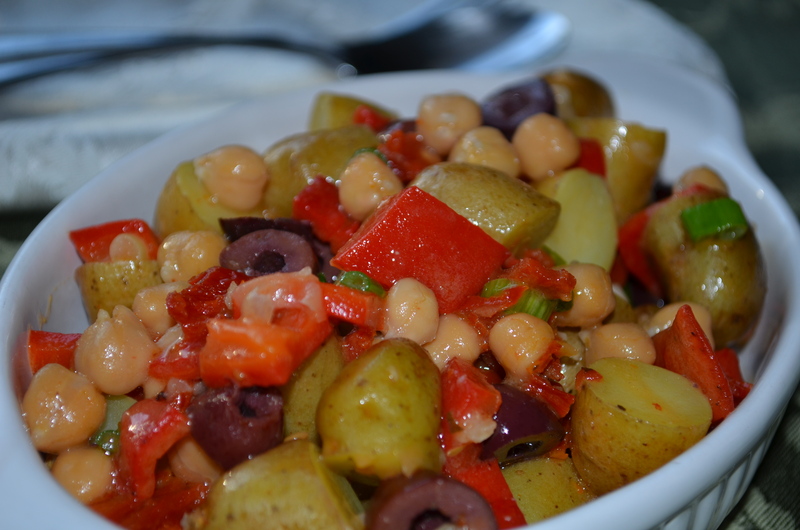 It takes about 5-10 minutes to put together, and is best served with tortilla chips or pita bread. I don’t send my girls off to school with their lunches in a china bowl (as in the picture), but I do have plastic snap top boxes that come with a fitting ice pack. 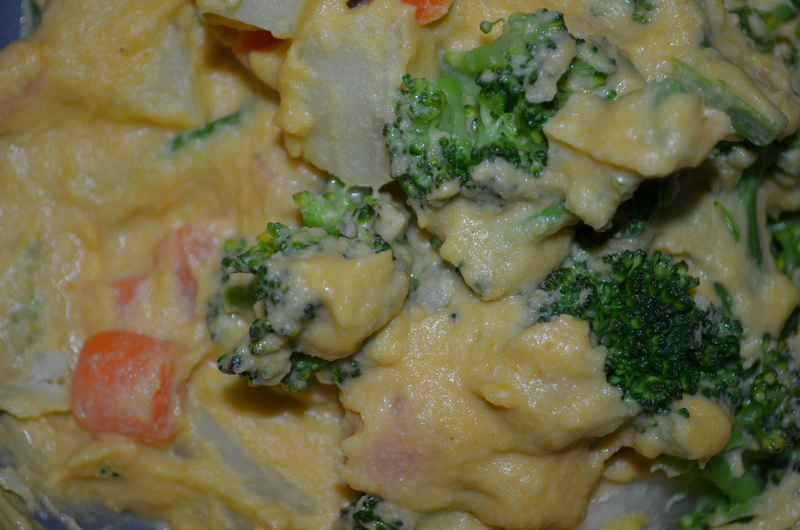 Note that the recipe in this blog includes green and lima beans for saucing with this dip, but those are not necessary here! 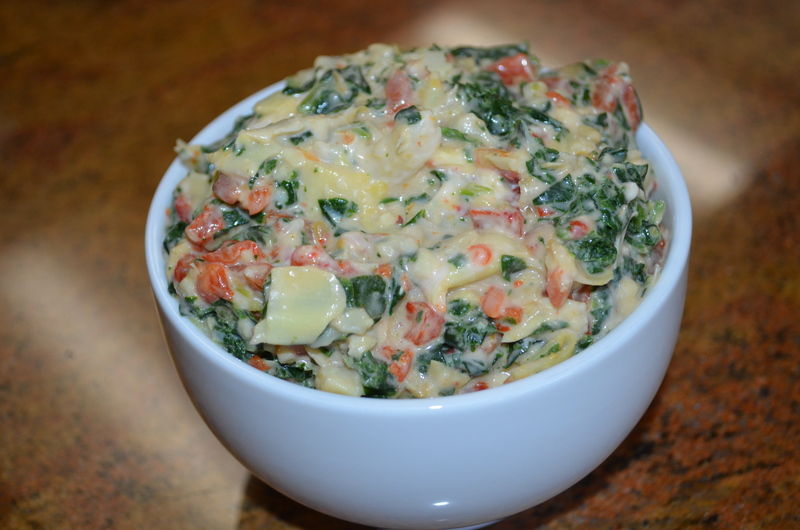 My daughters likes the version of this that has plenty of sun dried tomatoes. Actually, my husband also likes it, so I make plenty and put what the girls don’t eat, in the fridge.